If a baseball cap or hat of any kind has suddenly become your trademark, it's time to get to a salon. The single best thing you can do to immediately improve the look and condition of your hair is a great percision hair cut. Have you moved to a new location or city or are you just looking for a new stylist? The best way to find a skilled new stylist is to stop people whose hair you admire (great cut, superb condition and even better if their hair has a similar natural texture as your own), and ask them where they get their hair done. Time and time again we have new clients that say they came to Jazma because the last 5 people they stopped, whose hair they admired, all said they were clients of Jazma. I have always found without exception, that people are happy to refer you to their salon and stylist, if asked. Unless we know a stylist personally and their work, this is the only way we recommend to our clients to find a new salon and stylist when their job or other reasons force them to have to relocate to another city or country. You don't have to be an expert to know when something looks good and was done by a skilled craftsman in any trade. Whether it is a great hair cut and style or anything else that takes experience and skill in to produce a fine result. Treatments or conditioners cannot repair split ends, period. When you tear a fingernail, you cannot repair it, it has to be trimmed before the tear continues to worsen . The same goes for your hair. If you have split ends you must trim them before they continue down the hair shaft and damage your hair. For clients who do not want to remove all the splits we trim and seal the shaft of the hair with our Kerabond Filler. This is done every three to four months and prevents the splits from going up the entire shaft of the hair. Always style your hair using a wide toothed comb. 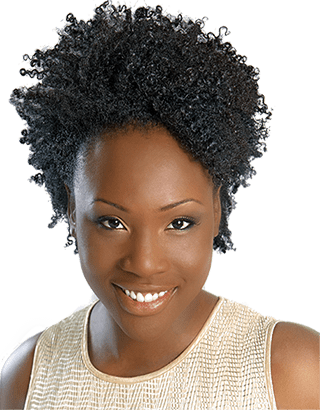 The teeth should be rounded on the ends to avoid scratching the scalp and without any seams from manufacturing which can snag your hair and tear it . When using a curling iron always use one that has a temperature control, that way it cannot become too hot and burn your hair. We recommend always using a thermal styling spray before curling for added protection against the heat. Curling irons should not be used on dirty hair. Iroing hair is like ironing clothes. The iron must be kept moving and the temperature must change when ironing your hair depending on the thickness of the individual strands of hair. For example, temperature changes with silk and cotton garments. Generally, hair tends to be multi-diametered especially at the hairline, where strands tend to be finer. When you blow dry your hair before curling, blow dry it to a point where there is still a slight bit of moisture left in your hair. If you do not blow dry your hair completely before curling and styling, this allows less heat for less time when curling your hair. It is similar to when you iron cloths. If they are slightly damp before ironing, or if they are completely dry, if you spray them a little with a water bottle just before ironing, they will take the heat from an iron faster and hold the press longer than if they were ironed dry. Similarly, if your hair is dry, give it a very light misting with a water spray bottle to bring up its moisture level, before curling. Blow dryers will scorch the hair, so keep the dryer moving. Never hold heat in one spot. Heat that is too hot will scorch the cuticles and melt the bonds. This leads to flattening of the natural texture, making your hair weak with a thinner feel. Be careful when brushing Black hair that is relaxed, colour treated or permed. Black hair is weaker as a result of these chemical processes. When your hair is growing out, it is weakest where the already processed hair meets the new growth. Improper brushing may snap the strands at this point. The straighter the hair is processed, or the more pigment removed from the hair the weaker it will be. Liquid hair styling tools such as mousse, add lift and volume to your hair. Since most people do toss and turn while they sleep, you should never go to bed with your hair in rollers or pony tails. This tossing and turning during sleep with rollers or pony tails, may cause the hair to pull and break. Extensions will do the same. Really try to refrain from putting your hair into ponytails. Ponytails put too much stress on the hair. The bands used for ponytails (elastics are the worst) cause breakage when putting them in and taking them out. If you find your hair tends to tangle or mat at night when you sleep, try using a satin pillowcase when you sleep. If you want a longer hold for your style when using a curling iron, try spraying the hair before you iron with a thermal styling spray. After the age of 35 your face may be affected by gravity and the natural aging process. After a certain age, longer styles will start to make you appear older rather than youthful. As you gracefully age, we recommend that you try keeping your hair in shorter styles, which generally speaking are more attractive for mature women. To increase the texture on thick or wavy hair, long layers will boost up the wave and curl. Always communicate clearly with your stylist, letting them know your exact wishes and the goals you wish to achieve for your hair. This way you will not end up with a cut or chemical service that you’re unhappy with. Ensuring a flow of constant clear communication will in turn allow your stylist to please you. If you do end up with a cut or chemical service you are dissatisfied with, call the salon and let them know. True professionals will always welcome both positive and negative feedback from their clients. A reputable salon will do all it can within reason to satisfy an unhappy client. Make sure to call right away to allow the salon to address the problem immediately. Remember, a great haircut is the foundation of a perfect hairstyle. When choosing a haircut to suit your face, body structure, hair type and reflect your personality. Specify when booking your appointment that you want a personalized haircut consultation. 1. Find a good qualified hair care professional or educate yourself by using our Wash and Wear Show and Tell Vol 2 DVD and website. 3. If you find your bone straight hair won't hold a curl when ironing, the reason is all the elasticity is gone and roller sets and wrapping is better. 5. Do wet roller setting more than blow drying and ironing when possible. If your hair is in a damaged state keep hydrated with water based products daily. 6. Daily setting can be done before having a shower or do rag or pin curl sets at night or wear wash and wear more often to keep hair hydrated. 8. Have protein colours 2 to 3 times a year, they add shine and will help strengthen your hair. Permanent high lift colour will always dry the hair, the lighter you go the dryer the hair. 9. A light daily moisturizer on dry ends will keep them pliable and help their condition. Dryer hair needs more hydration, shampoo hair every 3- 5 days with a SLS free shampoo, followed by your recommended conditioner. 10. Do not use hairdressings that have petroleum products, mineral oils or beeswax. 11. Have regular trims to stop split ends, you don’t have to take much off, just the ends and seal with the Kerabond filler. 12. When it's very hot and sunny outside keep you hair covered and protected from the sun. Try to use hair care products that that contain a sun screening agent. Sun burnt hair cannot be repaired. 13. Don’t cover or tie up your hair with porous materials, they absorb the hair’s natural sebum and moisture. Covering hair with these materials leads to breakage. Use satin or silk to do cover hair you can also line your hats with a slippery non porous material. 14. Do not use elastic bands or sharp hair ornaments in your hair. Do not put your hair in ponytails. The bands will snag and rip your hair as you put them in or take them out. The ponytails put unneeded stress on the hair and scalp. 15. If you feel you want to wear braids, please make sure that they are not too tight; larger sections and looser is better than fine, small, tighter sections. In our opinion small, tight sections put too much stress on the hair's follicle, and over time may cause them to produce poor, weak quality hair. Keep in mind extensions can cause nicks and cracks on the cuticle layer when too much stress is placed on the hair while sleeping and moving the extension around. 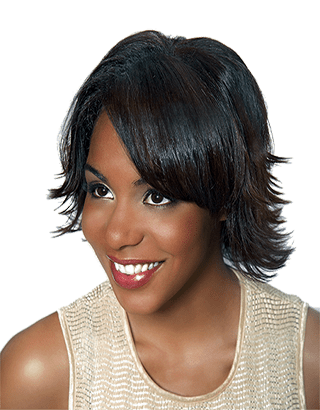 Braids that are too tight act like braces on one`s teeth, so they should be done as loose as possible without putting stress on the hair. 17. There are no instant or quick ways to achieve healthy, longer hair, it will take time and planning. With some of the new clients that come to the salon with damaged hair,we tell them that it may take a few years to get their hair back to a healthy state and to the length they want.They have to be patient, but this patience will be rewarded in the end. 18. When swimming avoid chlorine. Wet your hair down soak with a conditioner and wear a swim cap if possible.Once the hair is saturated with water and product it cannot absorb the chlorine. Water (moisture) accounts for about 8% of the total weight of our hair, this will vary a few percentage points depending on the relative humidity present, how "moist" the air is around us, and the relative humidity which is determined by the weather conditions on any given day as well as the geographical area where we reside. We can affect the form or shape that hair can take in two ways. The first way is through temporary means. These temporary means may be through the application of heat by such implements as curling irons and hot combs, or by wet setting the hair then going under a dryer, or just naturally air drying the hair. 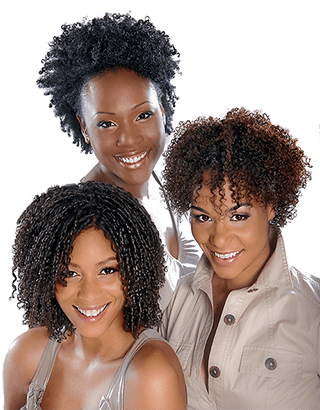 The second way is a more permanent one, through the application of chemicals to the hair such as relaxers or permanent waves we alter the shape of the hair. Both of the previous methods act upon different bonds that are found in hair. With the temporary method these bonds are called "hydrogen bonds" and with the permanent method these bonds are called "disulfide bonds". It is the temporary hydrogen bonds that are the cause of any problems you may be experiencing with frizzy or puffy hair. 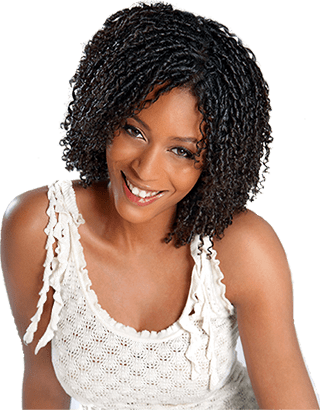 Here is how this happens; when your hair starts to frizz or become puffy what is taking place is that the moisture in the air around you, at it's worse when it is rainy, foggy or humid outside, is causing the cuticle layer on your hair to open. This moisture then enters into your hair where it is able to break the temporary hydrogen bonds, that were holding your hair in any given style (usually a straight one), causing your hair try to revert to its natural state. You may be reading this and saying to yourself, I don't wet set or press my hair and my hair still frizzes? If this is you , you need to realize that when you naturally air dry your hair the weight of the wet hair causes a form to take place. Even when you blow dry or diffuse your hair you are still causing a "set" to take place albeit a natural formless one, in both instances. When you venture outside and there is a higher relative humidity level brought about by a change of weather conditions such as rain or fog, these hydrogen bonds are broken and a change in your style takes place. With this unwanted change you will see frizzing and puffing. I also want to mention that even when it is not foggy or rainy out and you leave your home your hair may start to frizz. The frizz is most noticeable when you are leave an air conditioned environment. The cause of the frizz is the breaking of the hydrogen bonds. This will always happen whenever you go from one area to another if there is a difference in the relative humidity levels present between the two. Your hair may unintentionally frizz if you style your hair at home, have all the windows open, and the relative humidity is about the same inside your house as outside. If you go to work where there is air conditioning, your hair may now start to become frizzy as it loses moisture to the dryer office environment. It is moisture moving not only in but also out of your hair that can cause the breaking of hydrogen bonds, and the result for some people is frizzing. What do you do? A barrier must be put on your hair to stop or impede this exchange of moisture. This is the only really effective way that we have found to help stop the frizzies. By far the most effective of these type of products are the new technology silicone based products such as Kerasoft Glosify Hair Polish. These products will seal and protect your hair as well as add shine for an overall improvement in the condition or your hair. In most cases, layers of non humectant products starting from the conditioner, to the heat styling sprays, ending with silicones and finishing with hair sprays such as Kerasoft Instyle, will help to maintain your straight style and not leave your hair frizzy.